Welcome to the Radstock and Westfield 'Our Bigger Story' website. This is part of the multi media evaluation of 15 Big Local areas in England. The website is an opportunity to follow what is changing in Radstock and Westfield as a result of Big Local over a ten year period. br/>The aim of the website is to share the learning from everything that is happening in Radstock and Westfield with other Big Local areas and highlight what works in communities with a wider audience of practitioners and policy makers. Jim Gump spent 10 months running across the US, visiting schools along the way to inspire children to enjoy running and being active. Local residents voted for him to receive a grant at our fifth Dragons' Den in order to get that excitement and inspiration back home and to schools in our area. 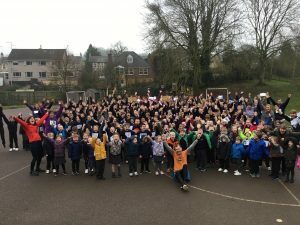 We're really pleased to report he has visited St Nicholas Primary School in Radstock and the children had an amazing time hearing about his journey. The school got in touch to give us this wonderful message: - We just wanted to say a huge thank you to you and to everyone at the Big Local. We welcomed Jim to our school last Friday (12th Jan). The children found him totally inspiring, they hung on every word during his assembly and especially enjoyed hearing about all the wildlife he has encountered on his many runs. Jim joined us for our weekly run around school and then spent time with each class so they could ask questions about his adventures. "Jim has inspired me to become more active and get outside more" said one year 6 student." - Well done Jim!